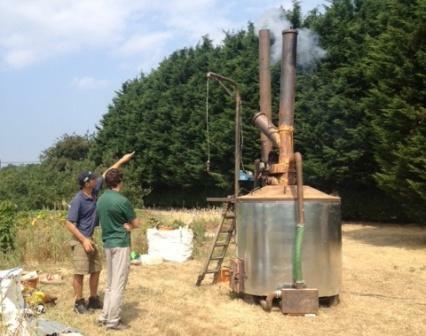 Carbon Gold, a UK-based company, is working to fill what they see as a market demand for a small-scale transportable kiln that can utilize a variety of feedstocks. The company designed the unit based on the traditional ring kiln with additional adaptations that address issues of transportability and sustainability for pilot scale projects around the world. Now in its second iteration, the Superchar 100 kiln can produce up to 100 kgs of biochar per 8 hour carbonization cycle from a broad range of feedstocks from forestry and agricultural residue streams. 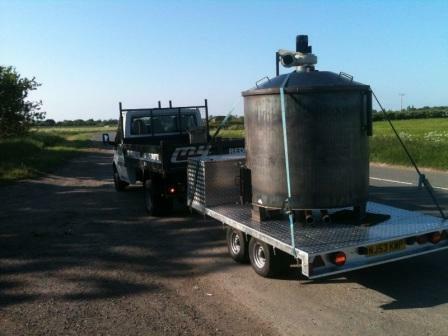 The kiln can be transported from site to site on a small trailer. With feedstocks such as wood chips, rice husks, coffee husks, and other agricultural residues, users can utilize materials at hand. The Superchar 100 was first used in Belize where Carbon Gold is working with cocoa growers within the Kraft Foods supply chain (for an earlier story on this project, please see: http://www.biochar-international.org/2018/04/02/carbon-gold-working-with-cacao-farmers-in-belize-to-create-a-rotating-biochar-production-and-utilization-system/). The Belize project is now in its fifth year and the cacao farmers are using biochar produced from cacao and shade tree prunings to improve their cultivation systems. When the work in Belize started in 2009, the team at Carbon Gold and the local farmers were using brick-built retorts to produce biochar, but it soon became apparent that the project required a different kiln design to better suit the local environment. Carbon Gold therefore designed and used the first Superchar 100 kilns as part of the project’s expansion following the first positive crop trial results with biochar. With the new kiln models, the project entered a second phase of implementation and biochar production—including field trials that followed more rigorous scientific protocols. These second trials compared different soil amendments (biochar, fertilizers, effective microorganisms, and other amendments) against controls on four different field sites. The trials produced strong results for the fertilizer/biochar blend—especially in nursery trials on germination rates, growth weight, etc. Results on mature trees took much longer to document so the nursery trials were a good indication of the impact of different amendments in a much shorter timeframe. During the time of these trials, the area had a water shortage and the plantations suffered significant losses on cacao seedlings in non-biochar amended soils, but had 100% success on seedlings in biochar-amended soils, which survived twice as long with no watering. The project is now in its third phase and has recently secured $50,000 in United Nations Development Program funding to further develop more trials and production methodologies that can be scaled up. While the initial versions of the Superchar 100 kilns met local needs in Belize, the unit has now been adapted to be able to process a far broader range of feedstocks including wood chips, wood shavings, rice and coffee husks and other types of agricultural residue to make it more widely applicable. Carbon Gold has seen the greatest demand for the updated Superchar kiln from three project types: small community-based farm groups, rural development projects, and sustainable supply chain projects (normally driven and funded by corporate entities). Many of these project opportunities arise from Carbon Gold’s partnership with Pro-Natura, a non-profit entity that works around the world (with a heavy focus to date in Africa) in areas with severe desertification to grow “Super Vegetable Gardens”—which can produce fruits and vegetables in a short timeframe to local communities. These gardens utilize biochar as part of the soil amendment strategy. With this partnership, Pro-Natura develops projects and acquires funding and then utilizes Carbon Gold’s kilns onsite to produce the biochar. Carbon Gold also provides technical training to the onsite project implementers. The first of these Carbon Gold/Pro-Natura projects is in Turkmenistan, developed in partnership with a French engineering firm that is utilizing the Pro-Natura Super Vegetable Garden model to supply fresh produce to their worker community. 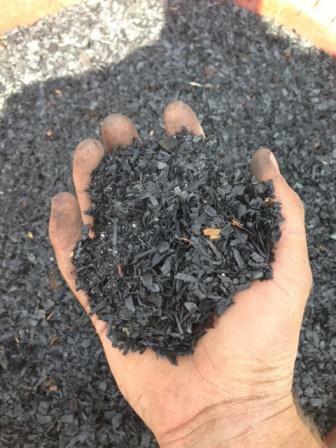 Sawmill waste (wood shavings) from the engineering site is utilized as a feedstock for biochar in that project, and biochar is utilized in the fields at the location. “Most interest for our kilns comes from individuals and organizations who want to build pilot-scale biochar systems and need an entry level unit that is transportable and processes a broad range of feedstocks,” says Simon Manley, Carbon Gold’s CEO. This entry-level unit size allows a project to investigate biochar production and utilization without a large financial investment. 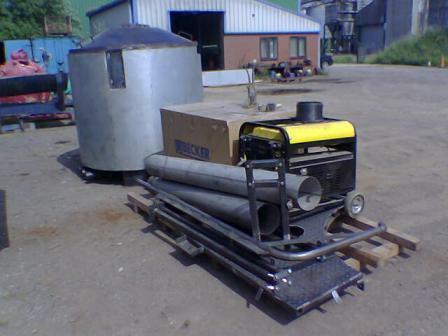 However, for projects in need of a larger unit, Carbon Gold has the Superchar 1000 which can process 3500 kgs of feedstock to produce 1000 kgs of biochar per 8 hour pyrolysis cycle. These larger scale systems can also be adapted to include heat capture for drying or electricity generation. In addition to these systems, Carbon Gold is selling a biochar blend in the United Kingdom called GroChar both on the retail and commercial markets. Carbon Gold has initiated field trials at 27 organic gardens in the UK, and is now working with six of the UK’s largest vegetable producers who are interested in finding a replacement for their use of peat moss in agriculture. The growers are finding that biochar can be a much more sustainable substitute for peat moss and elicits many of the same agronomic benefits as peat moss. Moving forward, Carbon Gold is looking for trading partners and organizations especially in the United States. For more information, please see: http://www.carbongold.com or contact Simon Manley at: simon@carbongold.com. Unit in operation (all photos courtesy of Carbon Gold). The Superchar 100 packaged for shipping to Turkmenistan. The Superchar 100 in transit.